Aluminium sports bottles printed in full colour by dye sublimation for exceptionally bright and vivid results. 600ml in size, in a silver bottle. Supplied with a threaded stopper, drinking cap and carabineer clip as standard. Ideal for outdoor activities, sporting events and leisure organisations. BPA free, reusable, durable and Suitable for hand washing only. The manufacturer of this product is an investor in people and has been used as an example of good employment practice in many government white papers and case studies. They were the first company to be awarded with the 'Investors in People Work Life Balance' accreditation and were also the first company to win the Castle Award for equality in 2002; the first ever award given out by the DTi to recognise employers' efforts to promote equal pay & opportunities in the workplace. They are part of a core leadership group working with Carers UK; the group lobbies Government and offers advice for employers seeking to support the one in every seven members of the UK workforce who are also carers. Other organisations involved in the group are BT, Unum Provident and PricewaterhouseCoopers. The group engages in the debate on care and support services, recognising that, even when employers offer support to working carers, what makes the greatest difference is improving their ability to juggle paid work with caring responsibilities. Where Far East suppliers are used, their factories are thoroughly audited for ethical manufacturing practices and product quality before any orders are placed and on an ongoing basis thereafter. In 2009 they were accredited to BS EN ISO 9001: 2008 for its quality systems, BS EN ISO14001: 2004 in recognition of its environmental practices and OHAS18001: 2007 for good Health and Safety practice. Branded with full colour digital print. Image above illustrates the use of the Green Impact logo only. Should you wish your logo to be included as well, the size of the Green Impact logo will be reduced to accommodate. 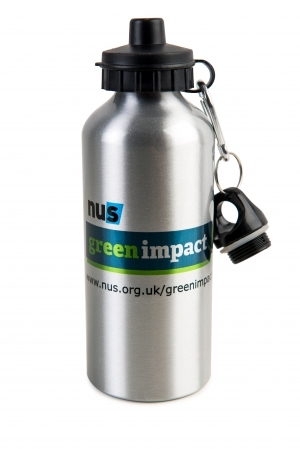 For items branded with your own design, with or without the Green Impact logo - minimum order quantity 50pcs. For orders over 500 pcs please contact us for a special rate.